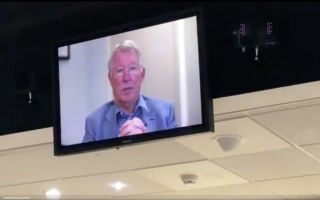 Ex-Manchester United boss Sir Alex Ferguson has paid glowing tribute to former player Paul Scholes in a video message on Friday. On this day in 1994, Scholes made his senior debut for United in the League Cup against Port Vale, beginning his incredible journey with the club that would span almost 20 years. The midfield maestro won 11 Premier League titles, 2 European Cups, 3 FA Cups, 2 League Cups and the Club World Cup during his illustrious career at Old Trafford, cementing his place in the English football hall of fame. He achieved all those great things under Ferguson’s stewardship, who is currently in recovery following a brain haemorrhage earlier in the year. As the Manchester Evening News reports, the former Red Devils chief looked in fine health in his cheery message to Scholes on Friday, as he called the Englishman the ‘perfect’ player. Check out the video below via Ian Sterling’s Twitter account.